The 3s and 4s secure significant victories in their quest for league silverware while the 1s and 2s fall to disappointing defeats. 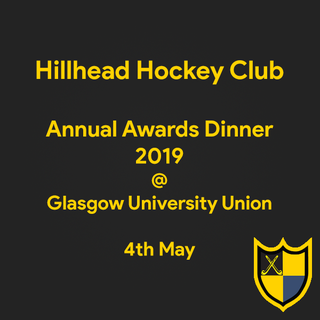 Read the full preview below and click the link at the bottom to secure your place at the Annual Dinner on the 4th of May. The opening 25 minutes of Saturday’s match was a tight affair with Mark Ralph’s side putting in a massive defensive shift against a well organised Grange side looking to secure the league title. It was always going to be a tough match to secure three points from however the start was promising. Unfortunately, after a succession of corners, Grange finally found the net and got the second from a penalty stroke not long after. Hillhead had chances and found space in between the Grange midfield and defensive lines however struggled to get that crucial breakthrough. A third goal from Grange arrived before Hillhead were able to pull one back through an Andrew Black miss trap from a yard out. Grange completed the scoring with a close range volley after Jamie Frail tipped a close range shot onto the bar. Results across the league were not favourable and this sees the 1s drop from 4th to 7th. Whilst mathematically possible to finish 4th by beating Uddingston and Edinburgh University this week the Hornets may require help from elsewhere in the league to regain that crucial 4th position. The 2s will have come away from Saturdays match somewhat disappointed having arguably had the better of the chances over the 70 minutes. However, its goals that win you points and Grove Menzieshill 2s got the only one of the game following a breakdown. Hillhead hit the post in response and piled on the pressure for the remainder of the game but were unable to beat the Grove keeper. Hillhead 3s will be pleased with the result against city rivals Clydesdale but Jonny Duke will be demanding more from his side in the remaining matches. Alan Meikle, Colin Gallacher and Gregor Munro were among the scorers as the 3s continue their push for silverware. The 4s moved 9 points clear at the top of West District 2 following a fantastic 5-1 win over Rottenrow 2s. Stephen Frame continued his fine form by netting a cheeky hattrick while Gordon Macintyre-Kemp and Simon Adams got one each. With only four games left to play the odds are in the fours favour however GMK will be keen to ensure that his side finish on a high and in style. Unfortunately Ayr had to concede the match. Click the picture below to secure your place at Annual Dinner!